I participated in the Sebastopol City Council Housing Subcommittee as a Planning Commission liason last summer. We had a series of meetings discussing how to create more affordable housing in Sebastopol. 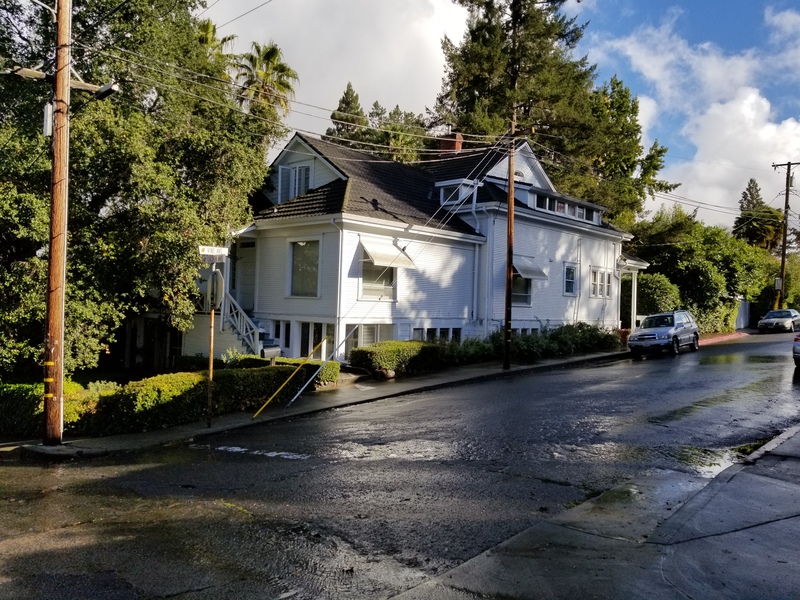 There are many reasons for the lack of affordable housing in Sebastopol, and many other places in California, but a fairly obvious one to me is that we no longer allow what has come to be called ‘missing middle housing‘ to be built in our residential neighborhoods. I’ve blogged about this before. Missing middle housing is used to refer to small, multi-family residences that used to be common in the early 20th century. Many neighborhoods from this period include duplexes, triplexes and small apartment buildings. They fill an important role in providing for small units that are affordable by design. 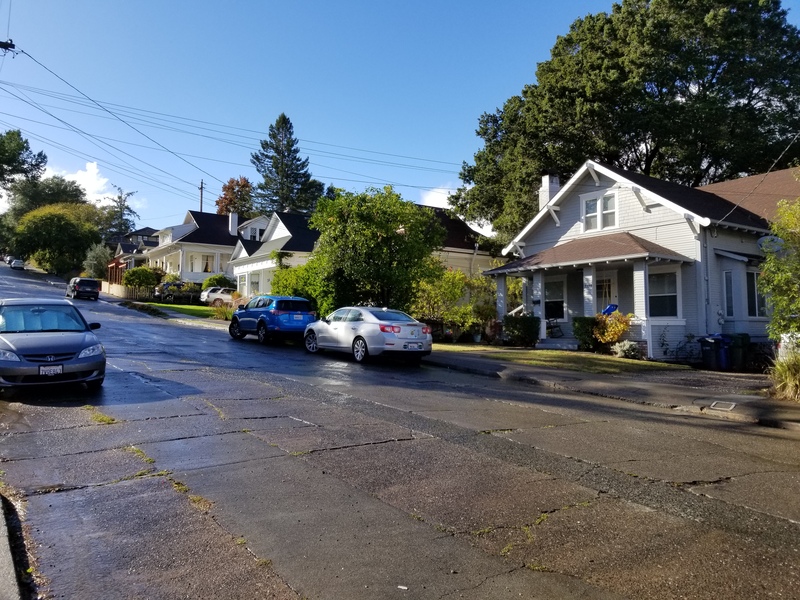 Missing middle housing provide higher densities that support transit and walkable neighborhoods, but at a scale that is compatible with single-family neighborhoods. And at the same time providing affordable housing. But we’ve zoned these neighborhoods out of existence. Most single-family zoned neighborhoods across the counrty only allow single family homes. 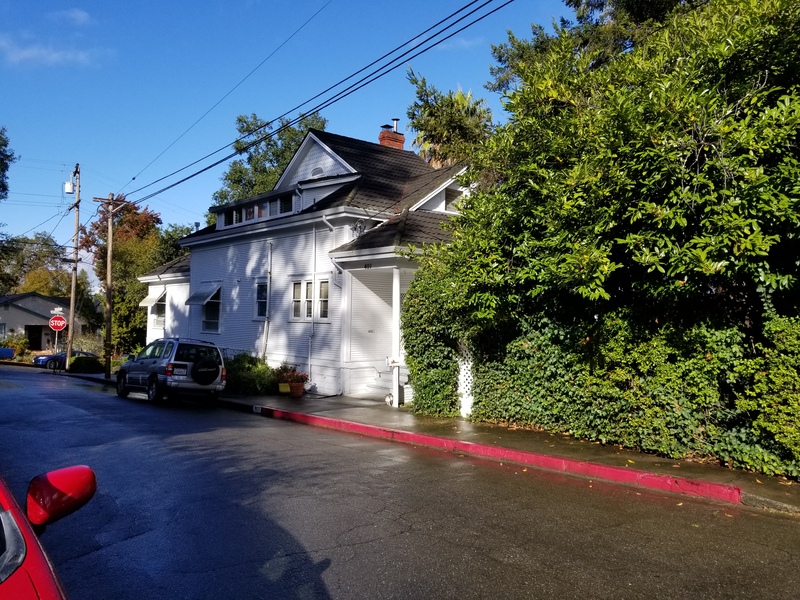 You can add an Accessory Dwelling Unit in Sebastopol, but you cannot build a duplex, triplex or small apartment building in a single-family residential zone, which covers most of the city. And accessory dwelling units are currently capped at 840 square feet which limits the size of household they can accommodate. Limiting neighborhoods to single-family homes has been described as ‘exclusionary zoning.’ Exclusionary zoning limits the type of housing allowed to single-family homes and separates households by their economic resources. 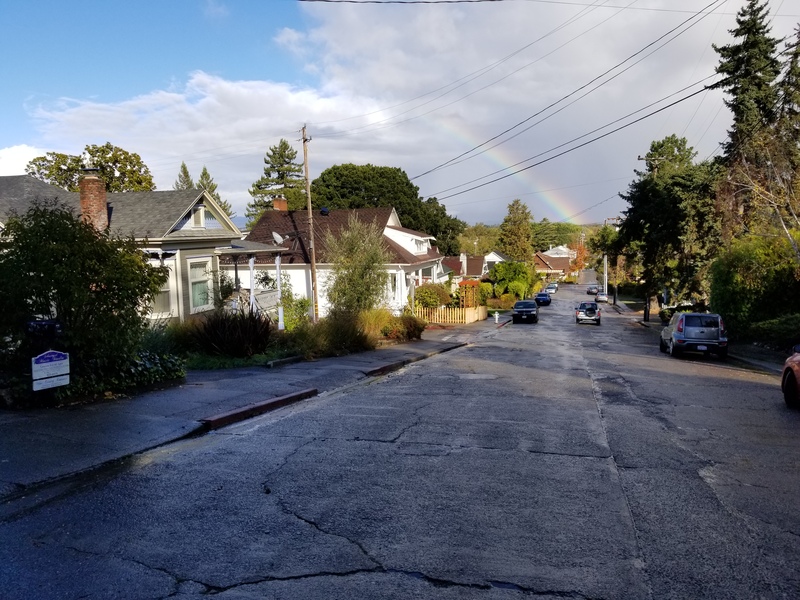 By not allowing duplexes, triplexes small apartment buildings and other missing middle housing types you exclude lower income households from a neighborhood. Richard Reeves provides a good description of the problems associated with exclusionary zoning policies in an op-ed. 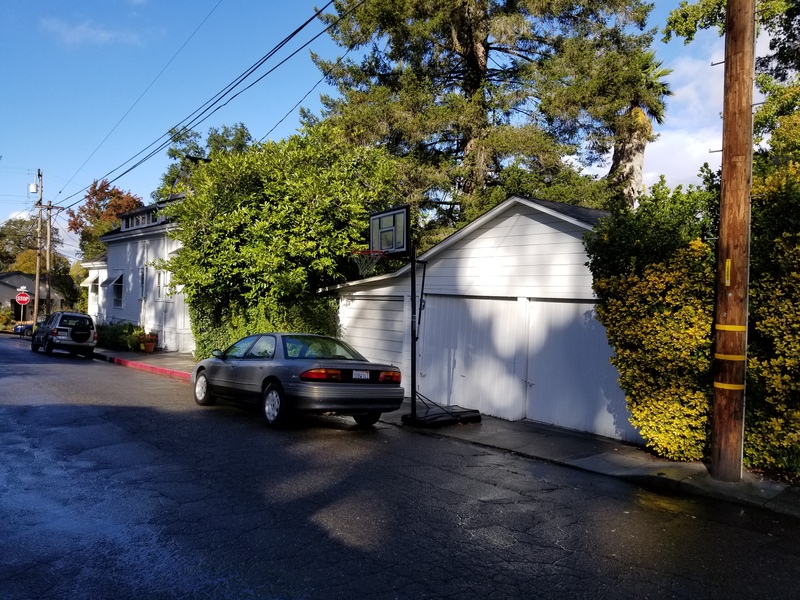 Housing in Sebastopol is becoming increasingly expensive, partly because so much of the city is zoning exclusively for single-family homes and there are limited sites in which to increase the housing density. But it is possible for a variety of housing options to co-exist with single-family homes. And concerns about increasing density, parking problems and allowing renters in a neighborhood tend not to come to pass. We do have existing neighborhoods in Sebastopol that accommodate a variety of housing options. Most of these are the older neighborhoods that predate any kind of zoning. 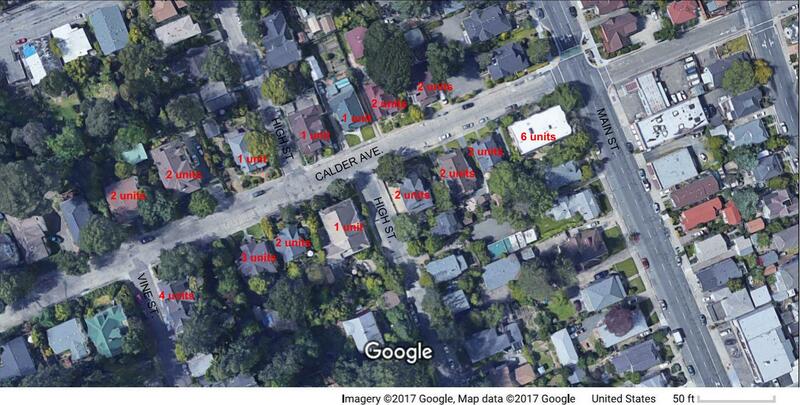 The number of units on the first 2 blocks of Calder Avenue in Sebastopol would surprise many people. Most of the properties in this stretch include more than 1 unit but they all look like single family homes. Some have a second unit incorporated into the original dwelling while others have a separate unit on the property. This 2 block stretch of Calder contains a total of 32 units and the total area of the 15 properties results in a density of 14.6 units per acre. This is slightly more dense that the 12 units per acre allowed by the General Plan. This neighborhood is about a 6 minute walk to the center of downtown with close access to many different services and amenities. The neighborhood has a WalkScore of 84. The home on the right is a duplex with one unit on the ground floor and one unit on the second floor. As far as I know it had been built this way, but it may have been converted. If the second unit is more than 840 sf it would not be allowed under the current zoning code. View looking east down Calder. The home on the corner has an ADU in the rear yard, you can just see it to the right of the house. The other 2 homes in this image both have a second unit in the ‘attic’. 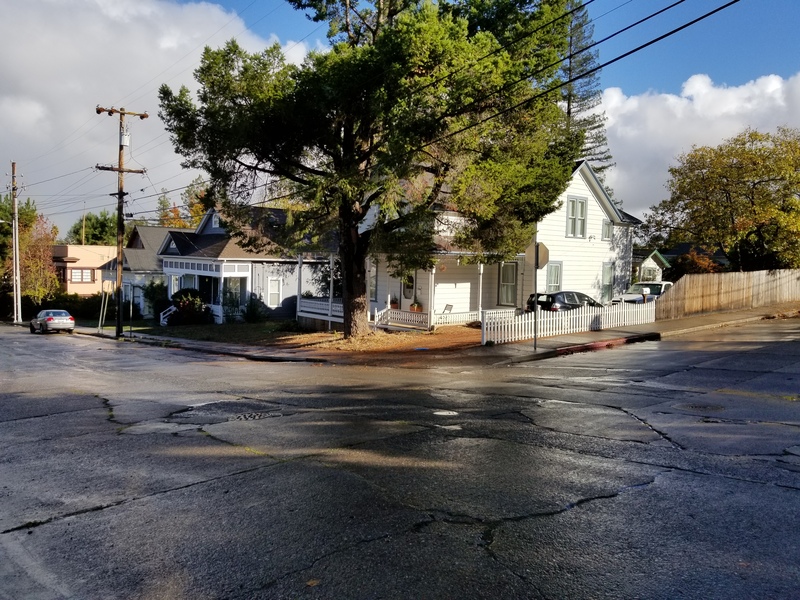 I would like to point out the 3 properties on these 2 blocks that have more than 2 units on them, which would not be allowed under the current zoning. 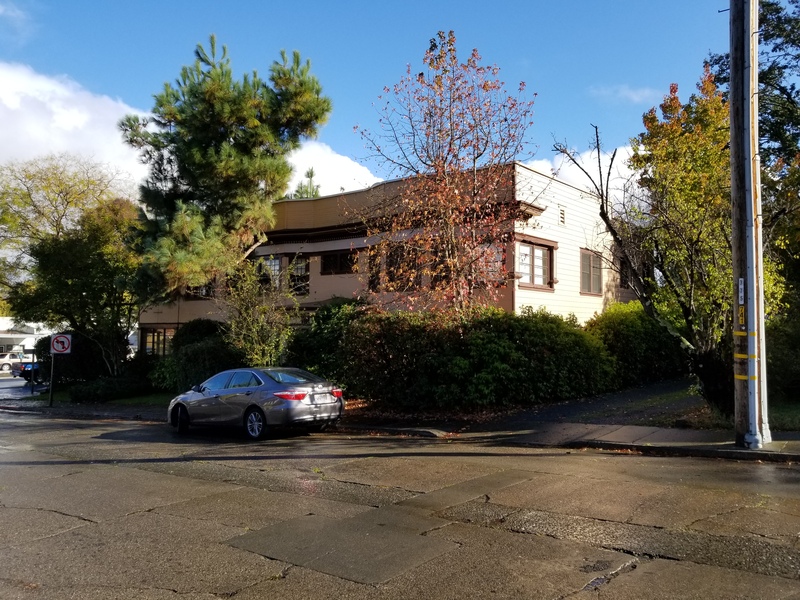 The apartment building on the corner has 6 units and 3 on-site parking spaces in a completely non-compliant ‘parking lot’ (the current development standards would require 12 on-site spaces – you could barely get 12 spaces on the 9,800 sf lot). Today the maximum number of units would be 3 under the density allowance, and only if part of a mixed-use development, and if you can get the required number of parking spaces on the site. Assuming 2 bedroom units (the current size of all 6 units), 6 spaces would be required by the apartments, but then you would have to add the parking required for the commercial space (the use with the smaller parking requirement is allowed to be reduced by 33% in a mixed-use project). So parking would ultimately determine how many units could be provided. I don’t think anyone feels this building is out of place in the neighborhood. And even with a severe ‘lack of on-site parking’ I have never seen a lack of available parking on the adjacent streets. This property completely fits the neighborhood and provides necessary affordable housing. Interesting fact is that the two adjacent lots (to the south and west), which are occupied by single-family homes (one with a second unit) have no on-site parking. So there are currently 9 housing units on this corner, with 3 off-street parking spaces. The way we discuss parking today, the thought of this would be absurd. You wouldn’t get a foot in the door if you came forward with such a development proposal today. The single-family home above actually has 3 units on the property. The primary house has 2 bedrooms. There is a unit in the attic space and another unit in the back yard. Again, I’ve never noticed a lack of parking in the vicinity or any other ‘problem’ with this number of affordable rental units in the neighborhood. The property is well-maintained and quite charming. It has not depressed the value of adjacent properties. 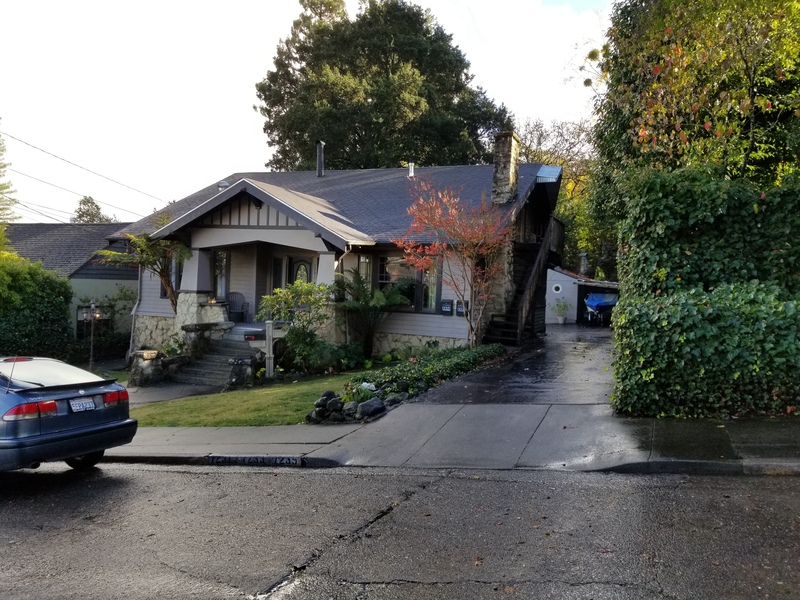 In fact, homes in this neighborhood sell for a premium (around the corner a 4 bedroom, 2 bath, 2,200 sf home that requires climbing 57 steps to reach, has no garage or driveway and while it has been recently remodeled, it still needs more, recently sold for just under $1,000,000). Only 2 units are legally allowed today. 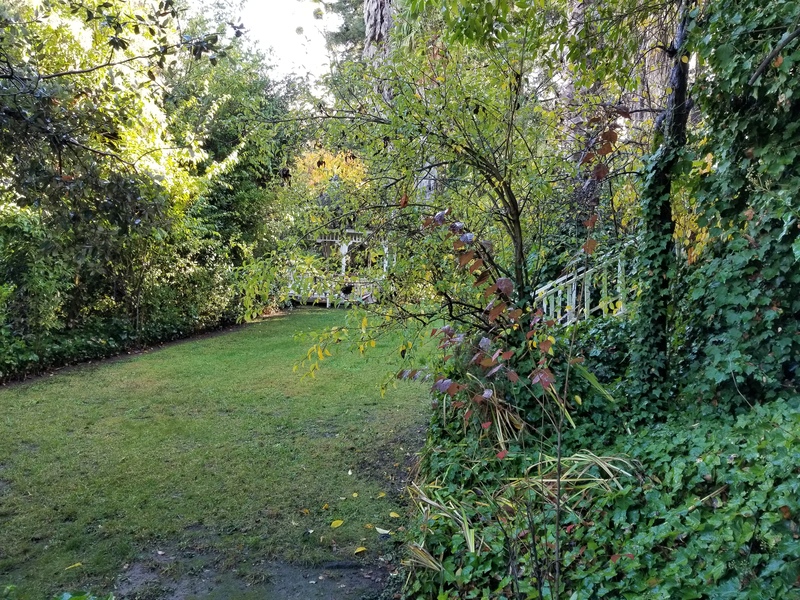 The backyard of the 4 unit building, actually a side yard given the corner lot configuration. The home is to the right. 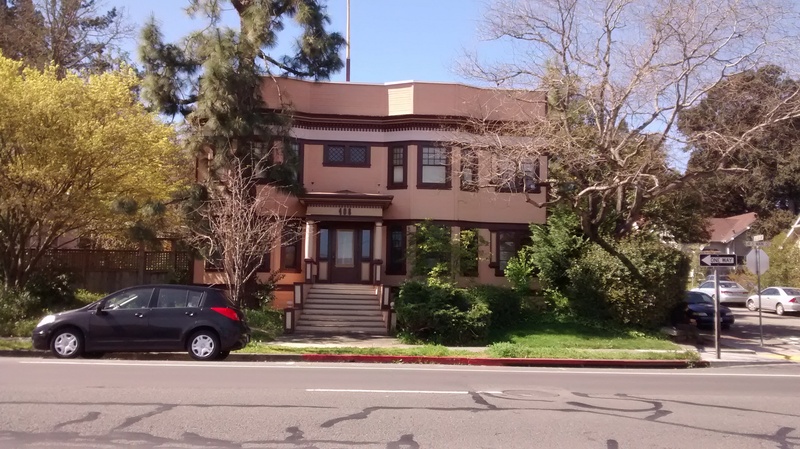 As can be seen in the above photos, the house has about a 2′ setback from the sidewalk. Today this would be required to be 20′ which would have a severe impact on this lovely yard space. The home above appears to have 4 units in it, at least if you count the mailboxes that’s what I come up with. 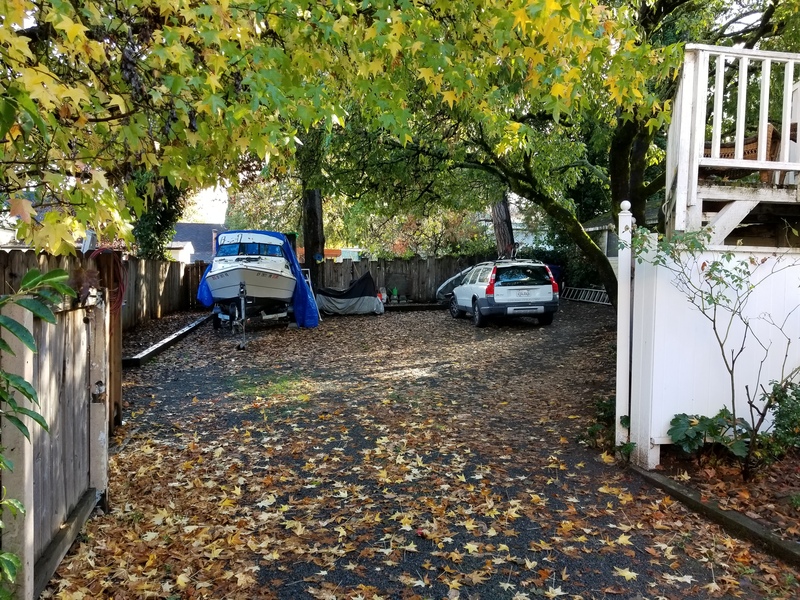 While there is a garage on the property it does not appear to be used for parked cars, and there is no driveway for parking. It is a corner lot so there is a lot of street parking available, but I never see all the curb space completely occupied. Not even close. Today this could be at most 2 units with one unit limited to 840 square feet. If these two blocks of Calder Avenue were to be rebuilt today, you would end up with at least 6 fewer affordable housing units. Think of how many more housing units we could build in Sebastopol with a less restrictive zoning code. We need to be up to the challenge with our zoning code update. Unfortunately this does not seem to be happening. There is a provision in the draft Zoning Code to allow residential only on commercially zoned properties like the apartment building with a Use Permit. But the allowed density has not increased so you would still be limited to 3 units maximum. Also 2 spaces per unit would still be required for off-street parking. And while I tried to get a provision included to allow the adjacent street parking to count toward the parking requirement, I could not convince a majority of the other commissioners to agree, so all the required spaces need to be on-site. The perceived ills from allowing more housing variety in neighborhoods that are primarily single family are simply not justified. These properties show how it is possible to create more affordable housing in Sebastopol. I live in this neighborhood, just south of Calder on High Street and it’s a great place to live. Allowing more units to be built would do no harm, and would allow more people to find affordable housing and live in a walkable neighborhood.